What is an "African American" and how does this identity relate to the African continent? Rising immigration levels, globalization, and the United States' first African American president have all sparked new dialogue around the question. 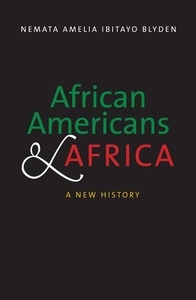 This book provides an introduction to the relationship between African Americans and Africa from the era of slavery to the present, mapping several overlapping diasporas. The diversity of African American identities through relationships with region, ethnicity, slavery, and immigration are all examined to investigate questions fundamental to the study of African American history and culture.